Perth, Dec 15 (CRICKETNMORE): After losing both their openers for eight runs, India managed to recover to post 172/3 at the end of day two of the second test of the Border-Gavaskar trophy here on Saturday, in reply to Australia's 326 in the first innings. 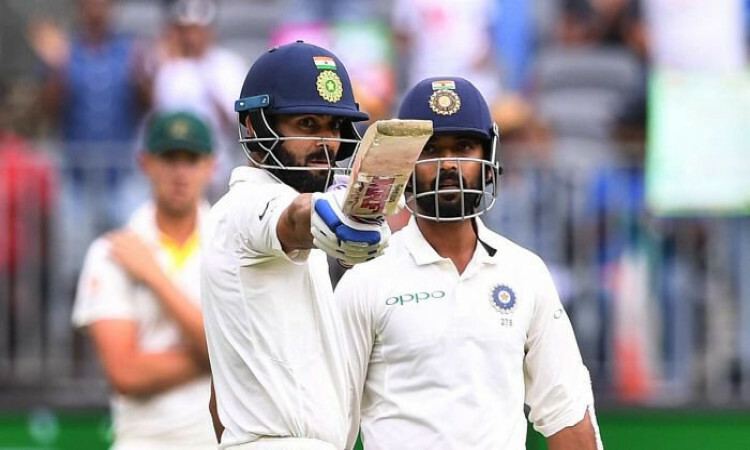 Indian captain Virat Kohli and Ajinkya Rahane were at the crease on 82 and 51, respectively, as they helped India come back into the match, while they still trail Australia by 154 runs with seven wickets in hand. Resuming at 277/6 on a difficult pitch, Australian captain Tim Paine and Pat Cummins put on a half-century stand for the seventh wicket, before the team was bowled out for 326, reports Efe news. Australia did well to get the openers out cheaply - with a wicket on each before and after lunch - leaving the visitors in trouble at 8/2. This led to Cheteshwar Pujara and Kohli putting their heads down to do some damage control. Pujara as usual anchored himself to the crease, while Kohli checked his aggression in the face of some very tight, disciplined bowling from Australia. By tea, India had managed to trudge to 70/2 in 32.0 overs without losing another wicket, however, the ball was still clearly in Australia's court. Ironically, it was only after Pujara fell, with the score reading 82/3, that India managed to actually push back against the relentless Australian bowlers. A brilliant counter-attack by Rahane eased the pressure on the Indian captain. The last hour of the final session was the most productive one for the visitors as both batsmen played more freely, while a tired set of bowlers looked less threatening. The match is evenly poised, but a lot depends on whether the home team can get some early wickets to gain the upper hand, especially considering that any lead in the first innings could prove to be decisive in the match. Brief scores: India (First Innings): 172/3 (Virat Kohli 82 batting, Ajinkya Rahane 51 batting) vs Australia (First Innings): 326 (Marcus Harris 70; Ishant Sharma 4/41).